The Universal Voltage Power Pack is a self-contained transformer and relay (an ON/OFF switch controlled by a circuit) designed for low-voltage 24 VDC occupancy sensors. 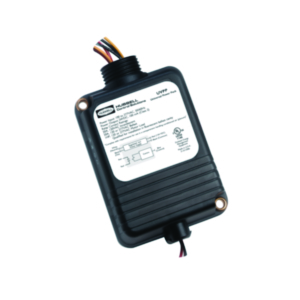 The power pack supports and automatically detects the line-voltage input within the 100-277 VAC range. This eliminates the need for voltage-specific power packs. This power pack is capable of switching 20A loads and features Zero Arc Point Switching, minimizing relay-contact wear from high inrush loads. A single power pack can power either 4 sensors or 3 sensors and the MPSA auxiliary relay for multiple circuits. The Universal Voltage Power Pack is plenum rated and easily mounts either inside or outside a junction box or inside a fluorescent ballast cavity.